We are here to help with compassionate abortion care. One in four women will terminate a pregnancy during her lifetime. You are not alone in your decision to have an abortion. At All Families Healthcare, we offer abortion up to 12 weeks from the first day of your last period. If you are farther along in pregnancy and wish to terminate the pregnancy, we will work to find a provider who can help you. DO NOT DELAY the care you desire due to financial concerns. Call us to discuss, we may be able to help. You can choose between two safe methods of abortion. Pills are used to end the pregnancy. A small, sterile tube is used to gently remove the contents of the uterus. If you are UNDER 16 (15 years old or younger), Montana state law requires that one of your parents or a guardian be notified of your decision 48 hours before your abortion. Please schedule an appointment as soon as possible for help navigating the notification law. We can help explain the law and let you know your options. There may be more costs and potential barriers to the abortion procedure the longer you wait. If you don’t know how to talk with your parent, we are here to help you prepare for that conversation. If you cannot talk with your parents, a judge may be able to excuse notifying them — this is called "judicial bypass." But if you need a judicial bypass, it can take time to get through the system. Yes, abortion is safe. There are many myths surrounding abortion from people who do not believe you should have this choice. While every surgical procedure involves some risk, the truth is that abortion is one of the safest and most common out-patient medical procedures in the U.S. – 14 times safer than carrying a pregnancy to term and delivering vaginally. 1 out of every 4 American women will have at least one abortion in her lifetime. 60% of the women who choose abortion are already mothers. The woman who chooses abortion today, may well choose parenthood later. Abortion at any gestation is always safer than childbirth. Everybody’s experience is different, but most describe the feeling as similar to menstrual cramps. We provide a calm and relaxing environment and the option of having a friend, partner or family member in the room with you. Being in such caring surrounding reduces anxiety and can help you feel more comfortable. Please let us know if you have any special needs or concerns. We will do everything we can to help make you feel comfortable. What do you give for pain? First, we offer support and comfort in a relaxing environment. Take-home pain medication is commonly prescribed for medication abortion, and our aspiration abortion patients are always given local anesthesia. Our patients report excellent pain management with these simple, safe measures. Will I be able to have children later? One of the myths surrounding abortion is that abortion causes infertility. Another myth is that the more abortions a woman has, the more infertile she becomes. There is no scientific evidence that abortion is in any way linked to infertility. Most of our patients have children and may also need abortion care during their lifetimes, all of this is a normal part of a healthy woman’s reproductive care. How early in the pregnancy can I have an abortion? Technology now allows us to know we are pregnant almost immediately, even before we have missed a period. Terminating your pregnancy early offers you two options – medication abortion, which begins with a pill in the office and is completed in the privacy of your own home, and early aspiration abortion. If you are worried you might be pregnant, come in and have a free pregnancy test. We also offer limited obstetrical ultrasound free of charge to let you know how far into the pregnancy you may be. Very early pregnancies, from 1 – 3 weeks of gestation, may not be detected by ultrasound – they are often too small to be sure there is a pregnancy in the uterus. If we are not able to view the pregnancy clearly under ultrasound, we will schedule your appointment for 1-2 weeks in the future. How far into pregnancy can I have an abortion? Each state in the U.S. has their own set of laws regarding abortion care. Currently, in Montana, abortions are offered up to 22 weeks of pregnancy. At All Families Healthcare, we offer abortion up to 12 weeks of pregnancy. If you are farther along in your pregnancy and wish to terminate, we will help you arrange for care. What’s better, the aspiration abortion or the pill abortion method? Both medication (the “abortion pill”) and aspiration procedures are excellent, safe methods. Some patients prefer the convenience of the aspiration procedure because right after it’s done they know their abortion is complete and can return to regular activities. Some women prefer completing the medication abortion in the comfort of their own home and setting the timing of their abortion around their work, childcare or life-demands schedule. The fees for both are comparable and insurance, Medicaid, and funding sources can help cover either choice. It is important for you to figure out what is most important for your abortion experience. We can help you determine which method best suits you. Can anyone come with me? Can they come into the abortion? We welcome your friend, partner or family member if you wish to have them with you during your appointment day. One to two loved ones can come with you for your visit, at your invitation. I am 15 years old, do I have to tell a parent? Abortion care is protected health information like any other, and cannot be shared with anyone without your written consent. In Montana, we have a parental notification law for those under 16. But that is the only exception to the protection of your privacy. How do I pay for my abortion? Currently in the state of Montana, Medicaid pays for abortion. If you have private insurance that does not cover abortion or have no insurance at all, you may qualify for Medicaid. Call to discuss how we might help you get Medicaid coverage. If you do not qualify for Medicaid, we charge a flat fee which is paid in full at the time of service. You may pay with cash, major credit card, money order, cashiers check, or PayPal. We do not accept personal checks. Please do not delay your appointment for financial reasons. Call us to discuss. We may be able to help. Do you offer financial help? 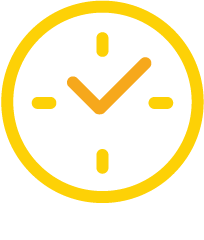 Let us know if due to financial burden, you are delaying or not getting the care you seek. We have a patient care access fund to help pay when patients otherwise can't. Let us know if you need assistance. Please consider making a donation. Click here to donate. No, but we do accept cash, major credit/debit cards, money orders, PayPal payments and cashier’s checks. Can I use my mother’s credit card? If you’re using another person’s credit card, they will need to be present during the time of payment, and will need a valid ID. They can also use PayPal through our website to help you out from wherever they are. monday: 9:30 a.m. – 5:00 p.m. Walk in Teen Clinic Mondays 3:00 - 5:00 p.m.!! tuesday: 11:00 a.m. – 6:00 p.m.
wednesday: 9:30 a.m. – 5:00 p.m.
thursday: 11:00 a.m. – 6:00 p.m. Parking and clinic entrance are found on the back side of the building. 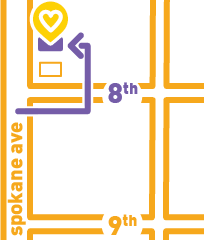 Heading North on Spokane, turn Right on 8th Street to find our entrance. all families. all people. all care.